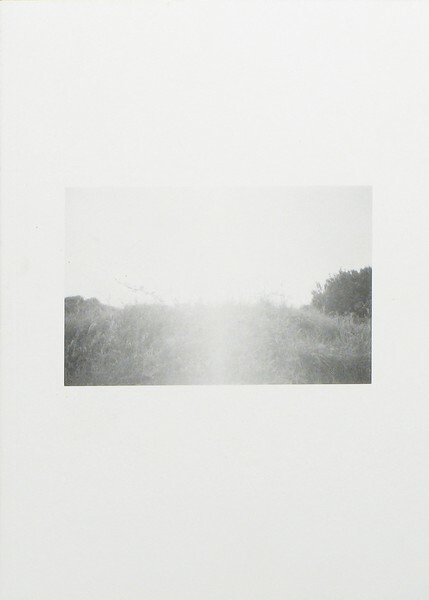 Book Review Meridian By Colin Stearns Reviewed by Adam Bell If all photographs are afterimages — traces and disclosures of an ever-changing world — what is gained by foregrounding this fact? Always previous and elsewhere, images reveal people we’ve known, know or may never meet, as well as places we’ve been or may never visit. They linger, reinforce or displace memories, and come back in unexpected ways. Meridian. By Colin Stearns. RITA, 2015. RITA, New York City, USA, 2015. 140 pp., 82 black-and-white illustrations, 6x8¼". If all photographs are afterimages — traces and disclosures of an ever-changing world — what is gained by foregrounding this fact? Always previous and elsewhere, images reveal people we’ve known, know or may never meet, as well as places we’ve been or may never visit. They linger, reinforce or displace memories, and come back in unexpected ways. A personal reflection on the vagaries of photographic vision, Colin Stearns’ self-described photo-novel Meridian gathers three years of peripatetic images taken in France and New York City. Modest and unassuming, the images follow the life of a young man on the move with a camera. Alone and restless, he gazes at the world from a distance and moves through a landscape of foreign cities, parks and wilderness, and the confines of anonymous hotel rooms and flats. Less romantic autobiography and more philosophical missive, Meridian points to a past that is slipping away and yet held still in mute images. In geographic terms, a meridian is a line of constant longitude that circles the earth and passes through a terrestrial pole. In more human terms, it is also a period of great achievement or happiness. Stearns’ meridian contains both possible meanings. The book begins and ends with the same image — a tangle of vines suspended and illuminated in the woods. In both instances, the image is faint, a trace on the page. Although Stearns has not circled the earth, he leads us back to where we began, though forests, gardens, beaches, hotel rooms and cities. The emotional meaning of the work is less clear, but might be inferred by what is excluded and slips from our grasp. If this is a Bildungsroman, what’s notable is what’s left out. Instead of formative events, we get their peripheral echoes or absence. While a few people appear in the images, they are typically seen from a distance or from behind. Walking down streets, blurred, shrouded in foliage, or off in the distance, they move away, imbuing the work with a sense of isolation. The cause or reason for this is never revealed, but is felt throughout the book. At first glance, the images and book seem slight and inconsequential, yet the modest sizing and printing belie the ambition and subtlety of the work. Like any good photobook, the images gain their strength when seen and read together. The black-and-white images describe a transitory and modest existence. No text is provided to guide us through the series of unmade beds, views out hotel windows, and meandering walks through city parks. Images, taken seconds apart and from different angles, appear next to each other or later in the book. What at first appear to be heavily inked images bleeding through thin pages are slowly revealed to be the intentionally faint echoes of images from the previous page or earlier in the book. Often slight variations of previous images, they appear like distorted memories or opaque traces. Rather than describe a linear narrative or trip, Meridian points not only to the ways memories and the past eventually fray and come undone, but also how we attempt to hold them together, and in remembering or imaging them, rewrite our memories.